Who knows? Maybe they were in a high-rise before, but in any case the quake helped test a theory, at least partially: Would all these earthquake-proofed structures actually withstand a massive quake? Of course, the epicenter of the one we experienced was a hundred kilometers off the coast of Iwate Prefecture, but according to reports, no buildings collapsed in Sendai, the nearest large city to the quake and one with its own share of skyscrapers. So the technology seems to work, and while it certainly saves lives and property, it doesn’t solve a more intractable problem: Once you’ve been in a large earthquake in a high rise, you don’t want to be in another one. I was writing an email when the quake struck at 2:46. I’ve lived here on the 24th floor for more than 10 years and been through a good share of them. Usually, they start with a disconcerting jolt and then the whole apartment sways gently but sickeningly. From what I understand there are two types of technologies for high rises in Japan. One is designed so that the building is flexible: the entire structure absorbs the energy and disperses it evenly throughout the frame. That means the higher up you live, the wider and longer the sway. The other type, which is more expensive, involves spongey shocks in the foundation that absorb much of the energy. We live in the former type. This time, I didn’t feel a jolt but rather a slight rumble from the floor that just kept building until the walls started rattling violently. Masako knew this was going to be bigger than the usual quake and started sobbing in the next room. We crouched under her desk together as she yelled out for her father (who died when she was eight) and the shaking continued; or, more precisely, it gradually changed to swaying, but the swaying was much wider than in the past. The movement wasn’t as terrifying as the noise: a massive creaking sound. And it went on for more than a minute. A truism in Japan says that most people who die in an earthquake are crushed by falling furniture. Actually, that’s not true: most die from collapsed structures, but the vast majority of these structures are wooden one-family houses. But there is something to be said for the falling furniture theory. Because so many Japanese residences have little if any storage space, homes are filled with tall, heavy wardrobes and bookcases, and if they’re not fixed to the walls in some way they will fall over. We don’t have much in the way of possessions, but the bookcases we bought are the type that attach to the ceiling, so nothing fell over during the quake except a floor mirror in the bedroom, and that didn’t break. The TV stand, however, which is on casters, would have moved all the way across the living room if it hadn’t been tethered to the antenna plug. The only thing damaged in the quake was our peace of mind. Though I now have utter confidence in the integrity of our building, I don’t want to live here any more if it means the possibility of having to go through that again, or worse; which is a shame, because I like this apartment. It’s well laid out, brighter than any place I’ve ever lived, and the view of Sumida River and the mountains of Nagano and Yamanashi is breathtaking. Of course, even if I were on the ground an earthquake can be just as scary, but being on the ground is a slightly more reassuring situation, since after it’s over you can get out of your building easily. After the shaking, we were basically stuck on the 24th floor. The elevators, after all, automatically stop in an earthquake and can’t be restarted until a technician arrives to turn them on again, and that could take hours. Having two cats (not allowed, thanks for asking) makes it even more difficult to get out. We have to put them in carriers and then schlep them down 24 stories in a stairwell that may likely be crammed with other people trying to escape. And if we stay, what if the water, gas, and electricity are cut off? Or, even worse, a fire breaks out? These were possibilities we’d considered ever since we moved in here but didn’t contemplate seriously until last Friday. It may be a safe building, even in a monster quake, but the attendant disadvantages make the prospect of such a quake almost as terrifying as a structural failure. And one more thing. The so-called building disaster team did nothing after the quake except apologize about the elevator. We live in a UR residence, meaning a semi-public apartment building, which is why the structure was state-of-the-art when it was built. But management is sorely lacking. We have never received literature outlining what we should do in a disaster. Apparently, we are supposed to get that from the public sphere; we’re supposed to know that stuff ourselves. But probably the saddest realization came when Masako went out into the hallway to see if any of our neighbors might need help. Ever since the couple who lived in 2409 moved out a year ago, we don’t know anyone else on our floor on anything like a name basis. No matter what you hear about the cohesion of Japanese society, it all goes out the window when they move into a vertical community: they don’t even greet one another in the elevator. Even in fear, they keep to themselves. You poor darlings. You’ve had a big shock. We humans normally walk around thinking that we are in control of 99% of everything, and yet we aren’t, are we? Nature is far, far more powerful than we and all our technology ever will be. I live in Kobe, and what I went through in ’95 was, well, not very pleasant. Bizarrely I have become quite fatalistic as a result – if it’s my time to go, it’s my time to go. I don’t even bother with an earthquake survival kit. I do however make a point of always wearing pyjamas to bed (formerly I slept in my undies). How are your cats? Give them a squeeze for me, and take it easy on yourselves. We were just talking about this tonight again after this morning’s aftershock. While we love living in Tokyo and Japan, we’re not so sure about living in a place that has earthquakes. If we end up staying long-term in Japan, we’ll accept them on some level, of course. But if we end up moving, it will be to a place not quite so prone to them. I’ve never been so terrified in my life. I completely understand why Masako began sobbing immediately. How did your cats react, by the way? The cats seemed more freaked out by our behavior than by the actual shaking. During the subsequent aftershocks we’d invariably grab them and put them in their carriers, just in case. Now we don’t bother, and they don’t seem to pay much attention to the shaking. Strangely enough, they’ve become more used to it than we have. Your descriptions of the high rise swaying and creaking is very interesting (and terrifying). 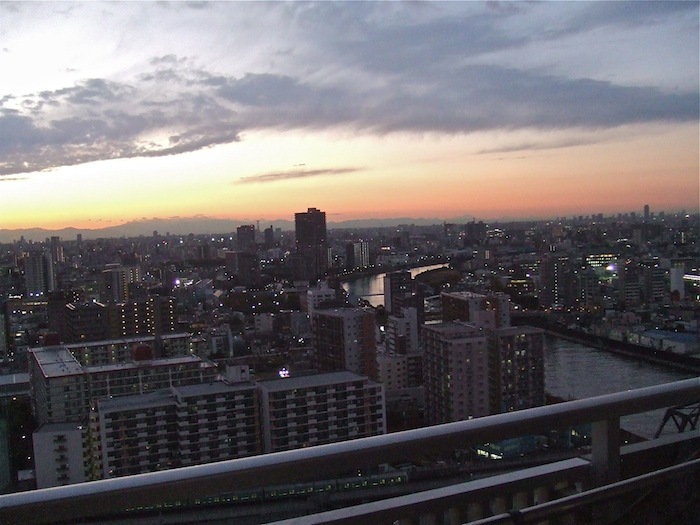 I would never want to experience an earthquake from the 24th floor of even an earthquake-safe apartment building. Glad to hear you two are OK. I think I live a bit south of this, on the South side of the Hibiya line (Minami Senju 3-chome, as we work in Sanya). We are moving, not because we live on the 24th floor (we are in a UR place, 4th floor of a slightly lower building) in a complex that was made about 7 o 8 years ago. It is safe/pleasant enough (we hope), though the whole area is devoid of the trees I miss from when I lived in Kamishakujii or Hikarigaoka (last also UR). We are leaving for southern Kyushu, where my wife hails from, because of the radiation, or willingness of people around us to suspend critical thought when they shop for veggies, fish and meat that may well not have been tested. it is this blind faith in authority, or at least submission to the reality that one can do nothing about it, that is making us leave. Enjoy your columns and movie reviews.